the heavy counterweights were hung which help the ground shafts go back in place. Last night, I finished threading the ground shafts (long-eye heddles), with Noah feeding me the threads from the maillons. It goes much faster with someone helping! So this is where I am right now, about to lash the tie-on rod to the apron, and then sley the reed. After that, I’ll start tieing on groups of threads, hoping to get that job done yet tonight. Tweaking will likely wait until morning. 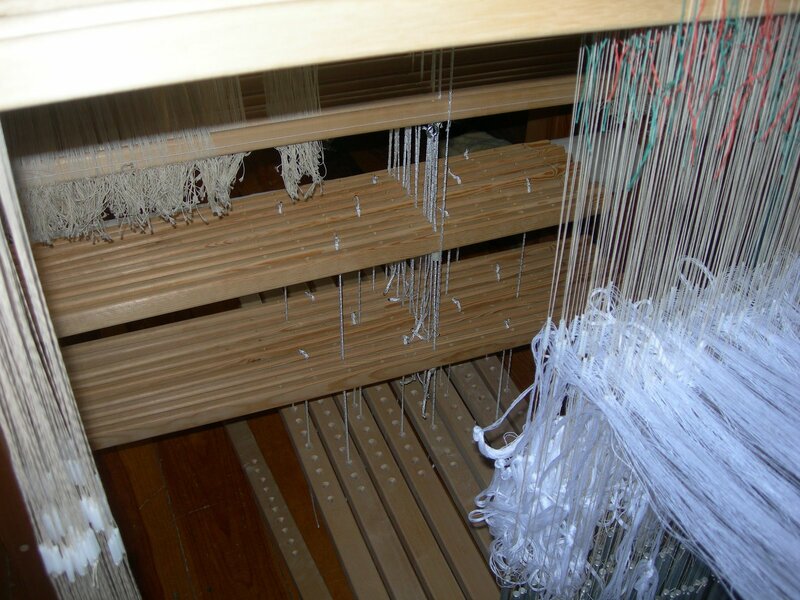 The countermarche is ready to weave on, the spinning wheel is ready as is the sock machine. Weaving and socks will be set out in the morning. The brochure racks are filled, for the Art Tour, Artistree, Pigeon Road Pottery, Circle of Life Studio, Arty Fridays, and of course, Shuttle Works Studio, including a new sock brochure created today in my “spare time.” Now, back to more cleaning, then the drawloom!